Satisfactory headline? Satisfactory headline. The Falcons appear to have taken the Pregame Tailgate Extreme Fanzone Sponsored By State Farm deal to a whole new level today. 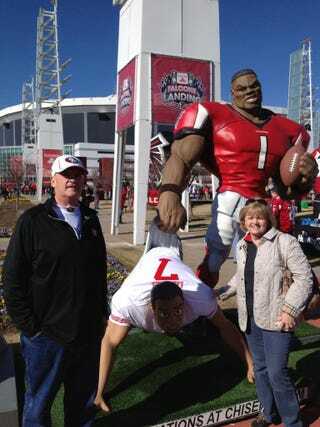 It proved to be a photo opportunity proud parents Rick and Teresa Kaepernick could not pass up: Number 1 in your heart and number i on your Falcons roster hoisting Colin by his skivvies.